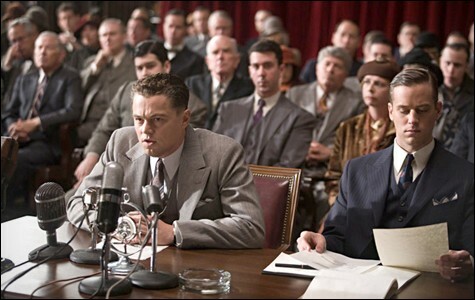 Leonardo DiCaprio stars as J. Edgar Hoover in J. Edgar. Directed by Clint Eastwood. With Leonardo DiCaprio and Naomi Watts. Opens Friday. J. Edgar, Clint Eastwood's biographical portrait of FBI founder J. Edgar Hoover, is not merely a disappointing way to spend two hours and seventeen minutes. It's a puzzlingly misconceived production, a truly troubling experience, the sort of movie that makes you feel ill at ease, almost heartsick, as you leave the theater. The movie is unnerving because Hoover himself was unnerving in the extreme. Obvious civil rights violations aside, his goal of streamlining the "national police force" beginning in the 1920s was at least arguably beneficial to Americans — catching bank robbers and kidnappers, etc. But lawyer and lifelong Justice Department bureaucrat Hoover (1895-1972) also had a lengthy and very personal enemies list: communists (he eagerly participated in every "Red Scare"), pornographers, unruly immigrants, abortionists, and essentially anyone not properly dressed. He hounded radical leftist Emma Goldman, a US citizen, until she was deported. Later on, after the FBI's crime-fighting reputation was secure, he maintained secret files on the sexual indiscretions of such perceived foes as Martin Luther King Jr., First Lady Eleanor Roosevelt, President John F. Kennedy, and his brother (and Hoover's boss) Robert F. Kennedy, and used them as blackmail. In short, Hoover was a powerful man on the wrong side of history, an insecure bully with plenty in his own life to feel guilty about. That's where Eastwood's film, written by Dustin Lance Black (who won the Academy Award for his Milk screenplay), comes in. Hoover, played with due diligence by Leonardo DiCaprio, is a confused amalgam of mama's boy, prude, not-so-latent homosexual, fussy bachelor-about-town, and vindictive political hatchet man — in addition to his aggressively self-publicized role as America's Number-One Cop. Making palatable screen entertainment out of that is a tall order for all concerned. Filmmaker Oliver Stone pulled off a similar stunt with his Nixon, but that 1995 film had a more coherent screenplay and a remarkable performance by Anthony Hopkins. 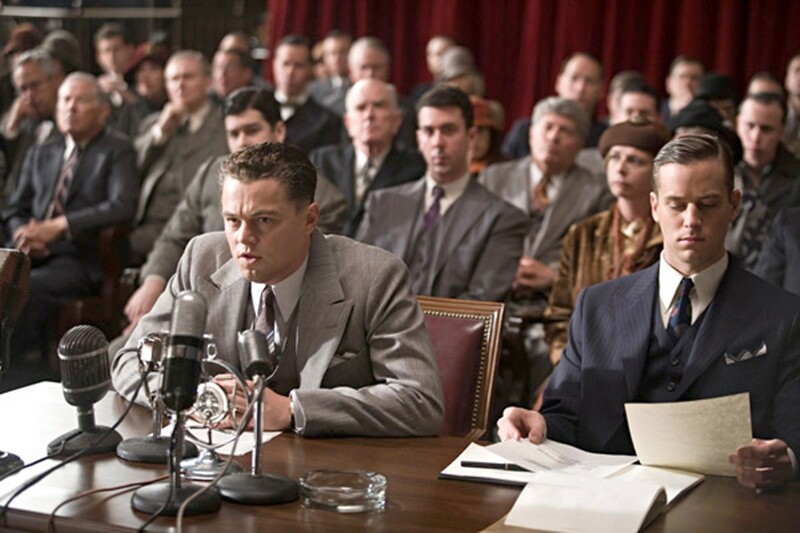 J. Edgar suffers from its near-hysterical point of view as much as from its loathsome subject matter. Is it a tale of epic-size hubris, or merely the stormy love affair of Hoover and Clyde Tolson (Armie Hammer), his second-in-command and longtime companion? The chronicle of a conflicted do-gooder or a right-wing police-state hate-monger? Are we really supposed to swallow the scene in which Tolson discovers Hoover's dead body, with that heavenly chorus on the soundtrack? What really made Hoover tick? Did he deserve this movie? Who's next in the rehabilitation biopic parade — George Wallace? Strom Thurmond? What was Eastwood thinking? Before going to see it, I made a short list of questions I hoped any biopic of J. Edgar would try to address. There were only two: Why did Hoover's FBI go after student anti-war protesters and African-American civil rights leaders but leave organized crime alone? And, far less important but still newsworthy: What's all this about Hoover dressing up in frilly black lingerie at parties at the same time he was compiling secret dossiers on people's sexual peccadilloes? The film pussyfoots its way past Question 1, barely touching on the much-reported scheme in which Hoover received payoffs from the mob in the form of "winnings" on fixed horse races. The theory that Hoover's self-hatred stemmed from having a black grandfather goes unmentioned. As for the cross-dressing, the film asks us to suppose it was only J. Edgar's tribute to his beloved mommy. It gives me no pleasure to stir the ashes of this doomed property. I've been an Eastwood fan from his Sergio Leone Spaghetti Western days, and cheered his directorial trajectory from Play Misty for Me all the way through Unforgiven, his masterpiece, and beyond. But J. Edgar was a losing proposition to begin with, despite able performances by DiCaprio, Hammer, Naomi Watts as Hoover's faithful secretary, and Judi Dench, who has the thankless job of playing the great man's doting mom. Some historical figures are best left to molder in the grave. Let's forget about J. Edgar Hoover, and this movie. J. Edgar is not showing in any theaters in the area.